nampiLLai blesses us with 3 different introductions for thiruvAimozhi vyAkyAnam looking at it from 3 different angles. Since all 3 of them start with “sriya:pathiyAy” (being the husband of srI mahAlakshmi), they are known as mudhal (first) sriya:pathi, iraNdAm (second) sriya:pathi and mUnRAm (third) sriya:pathi. We will see the gist of each one of them now. Note: This is the first and most elaborate introduction explaining various aspects of nammAzhwAr and thiruvAimozhi. bhagavAn who is the divine consort of srI mahAlakshmi, who has no unfulfilled desires, who is filled with all auspicious qualities and the supreme controller of everyone/everything gives his special mercy to nammAzhwAr who had gone through unlimited number of births in this samsAram (material world) without any exposure to spiritual knowledge. By his unconditional grace, such jIvAthmA (who was immersed in worldly pleasures) became nammAzhwAr who proclaimed that he took shelter of bhagavAn‘s lotus feet, realized the true nature of the essential principles and became blissful. As explained in srIvishNu purANam 5.6.28 “brundhAvanam bhagavathA krushNEnAklishtakarmaNA| subhEna manasA dhyAtham gavAm vrudhdhimabhIpsathA ||” (The all capable krishNa vowed effortlessly that the thorny fields were to be transformed to fertile green fields for the cows for their gazing), bhagavAn transformed a bound jIvAthmA to become nammAzhwAr effortlessly to be fully realized in all the essential truths just like how he transformed the thorny forest of vrindhAvanam to a beautiful fertile field. nampiLLai then elaborates how thathvams (truths) are explained in 17 philosophies – lOkAyadhika (chArvAka), Arhatha (jaina), the four schools of thought in baudhdha named vaibhAshika, sauthrAnthika, yOgAchara and mAdhyamika, naiyAyika (nyAya), vaisEshika, pAsupatha (Agama), sAnkhya (kapila), yOga (pathanjali), bhAtta, prabhAkara, mAyAvAdhi, bhAskara, yAdhavaprakAsa and EkAyana (one who accepts nArAyaNa’s supremacy without giving due importance to srI mahAlakshmi). nampiLLai then explains in detail how thathvams are understood in our philosophy. Our philosophy is based on thathva thrayam – the three thathvams viz chith (sentients), achith (insentients) and Iswara (God). These can be explained as one (single brahmam with multitude of attributes) when considered as prakAra (form/attribute) and prakAri (substance/object), i.e., Iswara as the prakAri (substance/object) and chith/achith as prakAra (form/attribute). Looking at the nature of the 3 different entities (chith, achith and Iswara), they can be considered as 3 separate entities. Then, chith, achith and Iswara are explained in detail. achith is explained the abode of three guNas (qualities namely sathvam/goodness, rajas/passion and thamas/ignorance), eternal, always changing, etc. Iswara is explained as the one who can bestow both worldly pleasures or spiritual upliftment based on the desire of jIvAthmA. chEthana (jIvAthmA) is explained as eternal, miniscule, one who is made of gyAnam (dharmi gyAnam – consciousness) as well as one who has gyAnam (dharmabhUtha gyAnam – knowledge), unchanging and subservient to Iswara. For a jIvAthmA who realizes the true nature of oneself whether it is the desire for kaivalya mOksham (enjoying oneself) or being immersed in bhagavadh guNams (auspicious qualities of bhagavAn), he needs to accept bhagavAn as the upAyam (means) to achieve such goal. In any case, the focus of true knowledge is bhagavAn only. Any other knowledge is as good as ignorance. It is explained in srIvishNu purANam 1.19.41 “thath karma yanna bandhAya sA vidhyA yA vimukthayE | AyAsAyAparam karma vidhyAnyA silpanaipuNam” (That action which does not lead to binding in this samsAram is good action. That knowledge which leads to liberation is true knowledge. Any action done for worldly pleasures is stressful. That knowledge which leads to any other goal than liberation is useless). To understand the nature of chith, achith and Iswara fully is very difficult. The best amongst such realized persons is nammAzhwAr. There is no one comparable to him amongst samsAris and nithyasUris. His glories are not known to himself, samsAris and bhagavAn himself. Since these glories were acquired by him by bhagavAn‘s mercy instead of his own efforts, he himself would not know his glories fully. Since there is no one like him is present in this world, samsAris (materialistic persons) would not understand his glories. Since bhagavAn could not bless and transform any one like nammAzhwAr, he also would not understand AzhwAr‘s glories fully. He is beyond the limitation of both nithya vibhUthi (paramapadham) and leelA vibhuthi (material world). Unlike nithyasUris who are present in paramapadham which is conducive for being immersed in bhagavath vishayam, he is able to experience the same bliss in this material world which in itself is a huge impediment for bhagavath vishayam. As seen in other vyAkyAnams, it is rare to get human form, its rarer to have desire to serve bhagavAn and its rarest to have the desire to serve bhAgavathas. Thus, it is a great fortune for the jIvAthmAs to have AzhwAr being born in this world (for their upliftment). His birth is as good as bhagavAn‘s incarnation. Sun removes the external/physical darkness. bhagavAn removes the ignorance (which is internal darkness). AzhwAr ensures that whatever blessings he had from emperumAn is shared with others as well. Just like brahmA blessed vAlmIki to have pure vision of srI rAma’s history, bhagavAn blessed AzhwAr to have pristine knowledge about the essential principles. As bhagavAn himself declares that the gyAnis are most dear to him in gIthA 7.18, he is the top-most of such gyAnis. Just like srI lakshmaNa who had great attachment for srI rAma from the time of birth itself, AzhwAr too was born with great attachment for bhagavAn . He is not attached to any goal other than bhagavath kainkaryam such as aiswaryam (material wealth), kaivalyam (self enjoyment), etc. Just like srI lakshmaNa said in srI rAmAyaNam ayOdhyA kANtam 31.25 “aham sarvam karishyAmi” (I will do all kainkaryams for you), AzhwAr too says in thiruvAimozhi 3.3.1 “ozhivil kAlamellAm … vazhuvilA adimai seyyavENdum” and sustains himself by serving bhagavAn always. Questions/objections raised and answers explained in nanjIyar‘s avathArikai are also explained in detail here by nampiLLai. Similarly AzhwAr‘s samslEsham (union) and vislEsham (separation) are also explained here in detail. The purpose/objective of thiruviruththam, thiruvAsiriyam, periya thiruvanthAdhi and thiruvAimozhi are also explained elaborately. In the first padhigam (decad), emperumAn‘s auspicious qualities are enjoyed by AzhwAr. In subsequent padhigams, AzhwAr enjoys those qualities in greater detail. thathva thrayam – Iswara, achith, chith are again explained in detail by nampiLLai. Here nampiLLai explains that Iswara is none other srIman nArAyaNan. Also, the special nature of “nArAyaNa” name is explained here. Even though nArAyaNa, vAsudhEva and vishNu names establish bhagavAn‘s vyApakathvam (omnipresence – all-pervading nature), the word/name “nArAyaNa” explains bhagavAn‘s auspicious nature and qualities in a precise nature. AzhwAr too having understood the importance of that, affectionately uses that name to indicate srIman nArAyaNan‘s glories in the beginning, middle and end (everywhere) of thiruvAimozhi. Also, kainkaryam to the divine couple – srI mahAlakshmi and srIman nArAyaNan as the ultimate goal is well established by nammAzhwAr through his pAsurams. Subsequently the nature of jIvAthmA, upAyam (means), upEyam (goal) and virOdhi (hurdles) are explained in detail. Followed by that artha panchakam is also explained in detail. nampiLLai establishes how to conduct oneself in samsAram with vairAgyam (detachment). One cannot go to the forest and live in seclusion – even in the forest, Adhi bharatha became attached to a deer. One cannot perform penance in water – even in such situation, saubari became attached to family life seeing the community of fishes. So, detachment does not mean staying in seclusion or doing difficult penances. But as said in thiruvAimozhi 1.2.3 “nIr numathu enRivai vEr muthal mAyththu“, one should give up ahankAram and mamakAram completely. One has to give up dhEhAthmAbimAnam (ahankAram) – considering oneself as the body and mamathA budhdhi (mamakAram) – considering the bodily relatives/properties as ones own. Wherever one is located, one can develop such attitude in his own place of residence and pursue bhagavAn – this can be seen in the lives of king janaka and srI kulasEkarAzhwAr. Thus budhdhi thyAgam (detachment in mind/intelligence) is the most important aspect. To remove such hurdles, bhakthi yOga (that can be pursued by brAhmaNa, kshathriya and vaisya) and prapaththi (that can be pursued by the ones who declare that they have nothing in their hands) are identified as upAyam in vEdhAntham. nammAzhwAr establishes that his opinion is to accept prapaththi only as the upAyam (In arumpadham, prapaththi is equated to bhagavAn himself as stated in “nyAsa ithi brahma” – saraNAgathi means accepting bhagavAn as upAyam). Many pAsurams such as thiruvAimozhi 5.7.1 “nORRa nOnbilEn“, 5.7.10 “ARenakku ninpAdhamE saraNAgath thanthozhinthAy“, etc., are cited to establish nammAzhwAr‘s views. Even while performing upadhEsam to others, he always instructs everyone to pursue the lotus feet of bhagavAn only as upAyam. He also explains that one has no engagement in karma, gyAna, bhakthi yOgams due to their nature (due to the involvement self-effort) and establishes that he did not have any self-effort and emperumAn blessed him out of his unconditional mercy. He also establishes that any one (even the ones filled with vices) can surrender to bhagavAn – emphasising that prapaththi is sarvAdhikAram (open for all). Though the adhikAri (who is devoid of anything in his side) is there and the upAyam (bhagavAn) is present, unless the upAya svIkAram (adhikAri pursuing bhagavAn) is there, the goal is not attained. Such upAya svIkAram is demonstrated by nammAzhwAr in his many pAsurams. He also establishes that “it is emperumAn who facilitated such upAya svIkAram” in many pAsurams. He establishes that one should have great attachment towards pursuing bhagavAn. He also explains to others that it is very easy to pursue bhagavAn. He also establishes that, this saraNAgathi (bhagavAn) is an independent upAyam that can ensure that the goal is achieved. For the ones who are attached to pursuing bhagavAn, they can pass their time in this world by engaging in the nectarean pAsurams of thiruvAimozhi and its meanings. For the ones who have thus pursued bhagavAn and spend their time in reciting/meditating thiruvAimozhi, AzhwAr establishes that initially one achieves victory/control over senses and ultimately achieves eternal kainkaryam. For a upAsaka (bhakthi yOga follower) such sense control is essential (and is acquired by ones own effort). For a prapanna, such control is bestowed by bhagavAn. He also establishes that the source of such person’s bhakthi is also by the causeless mercy of bhagavAn. He also establishes that such bhakthi is nourished by bhagavAn himself. Finally, it is bhagavAn himself who eradicated AzhwAr‘s relationship in this material world and bestowed him the ultimate bliss in parampadham. the means to be freed from such ahankAram/mamakAram and attaining of ultimate goal of kainkaryam is the Lotus feet of the most easily approachable supreme bhagavAn only. And control of senses to ultimate attaining of kainkaryam in parampadham is done by bhagavAn himself. As explained by periya vangippuraththu nambi, the whole of thiruvAimozhi can be explained through hArItha samhithA slOkams “prApyasya brahmaNO ruPam prApthuscha prathyakAthmana: | prApthyupAyam palam prApthEs thathA prApthivirOdi cha || vadhanthi sakalA vEdhAs sEthihAsa purANakA: | munayascha mahAthmAnO vEdha vEdhArththavEdhina: ||” (vEdham along with vEdhAntham, ithihAsam, purANam, etc, establish the five essential principles – brahmam (bhagavAn), jIvAthmA (soul), upAyam (means), palam (goal) and virOdhi (hurdles). The same is emphasised by great saints and sages who are well versed in the principles of vEdham). Note: In this, thiruvAimozhi is explained as an elaboration of dhvaya mahA manthram. Also, the main essence of each centum is explained by nampiLLai. bhagavAn who is the divine consort of srI mahAlakshmi, who has no unfulfilled desires, who is filled with all auspicious qualities and the supreme controller of everyone/everything gives his special mercy to nammAzhwAr who had gone through unlimited number of births in this samsAram (material world) without any exposure to spiritual knowledge. 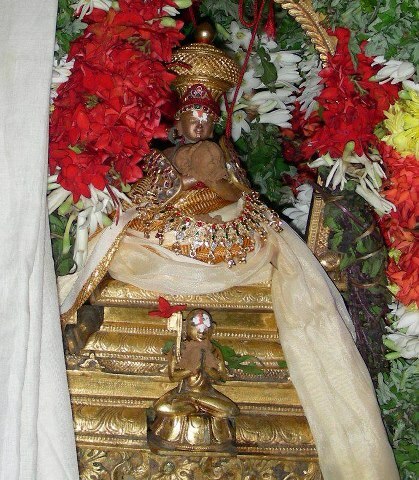 nammAzhwAr explains the meaning of dhvaya mahA manthram through thiruvAimozhi. In this, the first 3 centums (1 to 3) explain the second part of dhvayam. The second 3 centums (4 to 6) explain the first part of dhvayam. The next 3 centums (7 to 9) explain the auspicious qualities of bhagavAn, his detachment towards his own AthmA and body, etc, and finally his eternal relationship with bhagavAn. In the last centum (10th) attainment of ultimate goal is explained. In the first centum, AzhwAr determines that eternal service to bhagavAn is the purushArththam (ultimate goal), sruthi (vEdham) is the most authentic source of such knowledge and that bhagavAn is none other than srIman nArAyaNan. In the second centum, AzhwAr reveals his desire to be in paramapadham. Seeing that bhagavAn willingly accepts him and bestows him parampadham. AzhwAr says he does not want to force emperumAn to bestow him paramapadham and highlights that emperumAn‘s pleasure is his only goal. In the third centum, bhagavAn sees the great desire in AzhwAr for kainkaryam and he engages AzhwAr in kainkaryam at thirumalai (thiruppathi). AzhwAr too craves for such kainkaryam and also extends it upto kainkaryam to bhAgavathas and performs vAchika kainkaryam (kainkaryam through his speech/words). In the fourth centum, AzhwAr explains to others that the means to such kainkaryam is the lotus feet of bhagavAn and hurdle for ultimate kainkaryam to bhagavAn is the attachment towards aiswaryam (worldly pleasures) and kaivalyam (self-enjoyment). He also meditates on the same in his pAsurams. In the fifth centum, AzhwAr clearly establishes that bhagavAn himself facilitates his lotus feet to be the means for removing the hurdles and bestowing the ultimate goal. In the sixth centum, AzhwAr pursues such upAyam with the help of AchAryas and the recommendation of periya pirAtti (srI mahAlakshmi). In the seventh centum, even after accepting bhagavAn as upAyam his desire of reaching parampadham for eternal kainkaryam is not fulfilled. Whatever interactions he experiences emotionally does not transform into physical/real experience. So, he cries out in separation. In the eighth centum, understanding that the emotional experience cannot tranform into physical experience due to being present in samsAram, being in great agony, he thinks that he may still have some attachment towards self enjoyment or worldly pleasures and clearly declares that he does not have any attachment towards them. In the ninth centum, bhagavAn clarifies to AzhwAr that there is no need for doubting AzhwAr‘s attachment towards bhagavath vishayam and tells him “I am nArAyaNan, capable of everything, I will fulfill all your desires”. Hearing that, AzhwAr greatly enjoys and glorifies bhagavAn‘s auspicious qualities such as sausIlyam, etc. In the tenth centum, AzhwAr explains how bhagavAn descends as thirumOgUr perumAL, shows him the archirAdhi gathi (the path which leads to paramapadham) and ensured that AzhwAr himself says “You fulfilled all my desires”. Note: In this, nammAzhwAr is compared to srI bharathAzhwAn who was fully subservient to srI rAma and who existed only for the pleasure of srI rAma. When he has unaware of the principles of chith, achith and Iswara, bhagavAn himself shows him that achith is to be given up, chith is the one to pursued and Iswara is the top-most one to be pursued. Understanding that, AzhwAr realizes that this body is the hurdle for endless bliss in paramapadham and in thiruviruththam prays to bhagavAn to eradicate the hurdles that stop him from attaining that divine experience. bhagavAn then shows him all his greatness, simplicity (towards his devotees), divine beauty, etc., so that AzhwAr can enjoy them here in this world itself and AzhwAr enjoys that in thiruvAisiriyam. In periya thiruvanthAdhi, the overflowing love towards such bhagavAn is revealed. In thiruvAimozhi, AzhwAr explains that just like one who removes the indigestion, creates hunger and then feeds food, bhagavAn created the ruchi (desire) and that ruchi matured into parabhakthi, paragyAnam and parama bhakthi stages, remove his connection with this material world and finally attaining the ultimate goal in paramapadham. When srI bharathAzhwAn returned from his uncle’s place to ayOdhyA to serve srI rAma, kaikEyi called him “rAjan” (Oh! king) and put him in great agony (he always considered srI rAma as the king and himself as his servitor. He understood something was terribly wrong when called as king by his mother). nammAzhwAr‘s state was like this in thiruviruththam. After hearing that srI rAma was in chithrakUtam, srI bharathAzhwAn took along his mothers, the ministers, residents of ayOdhyA, etc., hoping that seeing the tears in the eyes of every one srI rAma will return to ayOdhyA. Enroute, he is thinking that surely srI rAma would return back with him when he bows down in front of srI rAma and pleads for his return. Thus he sustained himself by these positive thoughts. nammAzhwAr‘s state was like this in thiruvAsiriyam. srI bharathAzhwAn stayed in nandhigrAmam (the place outside ayOdhyA) for 14 years nurturing his desire to serve srI rAma. nammAzhwAr‘s state was like this in periya thiruvanthAdhi. Finally, when srI rAma returned to ayOdhyA, accepted the throne and ruled the kingdom, srI bharathAzhwAn served him in fitting manner. nammAzhwAr‘s state was like this in thiruvAimozhi. thiruvAimozhi‘s sangraham (shortened form) is first padhigam (decad). First decad’s sangraham is the first 3 pAsurams. First 3 pAsurams’s sangraham is the first pAsuram. First pAsuram’s sangraham is the first line in that pAsuram. This is like the whole vEdham’s sangraham is thirumanthram. thirumanthram is sangraham is praNavam. praNavam’s sangraham is akAram (the first letter of praNavam). mahAbhAratham and srI rAmAyaNam also have been compiled in this fashion of sangraha (shortened form) – visthara (elaborate form) method. Thus ends the 3 glorious introductions for thiruvAimozhi by nampiLLai. In the next article, we will see introductions for the 1st centum. This entry was posted in thiruvAimozhi on March 16, 2015 by Sarathy Thothathri.